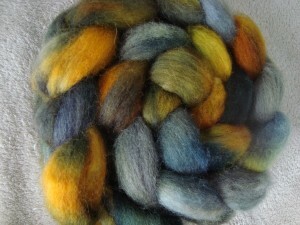 Before I go into the dye studio or sit down to plan a colorway, I usually set some broad goals about what I want to accomplish. Sometimes, I’m trying to pull out colors from a particular photo. Sometimes, there’s a color combination that I think is interesting and want to play with. And sometimes, I want to dye for a specific person. The last one can be tricky, because it’s hard to know exactly what a persons’ signature colors are, unless you know them very well. But every once in a while I run across a color that just absolutely belongs to someone I know. I don’t think that everybody does this, but for some reason my brain stores colors for all the people I meet. It’s just one of those details that is part of knowing someone for me – like recognizing their face, their style, their favorite foods or the smell of their go-to perfume. I stash away details like what color lights up their eyes, or highlights their skin tone, or matches their favorite piece of jewelry. If there is one person responsible for getting me thoroughly hooked on knitting, it is probably Anne. I stumbled across her blog sometime in 2006 or 2007, and immediately fell in love with her designs. I had been knitting for a while, but was getting bored with stockinette and the knit-purl stitches. Her blog opened up a whole new world of lace, and watching her designs develop caught my interest so deeply that I began to create my own. I haven’t been bored with my knitting since. Now, I don’t know Anne. Not personally, anyway. I’ve lurked on her blog for years, been constantly inspired by her work, and have learned a lot about designing and about writing from following her blog. When I began selling my own products, I looked to her to figure out how to talk about things for sale without making a sales pitch, while still generating real content for the blog. I met both Jocelyn and Amanda through her blog, and Ellen and Jan through Jocelyn. Through some funny twist of fate, more than half of the people that read this blog ended up over here because of Anne. But I don’t know her. So I set aside the color, as something to ponder for another time. 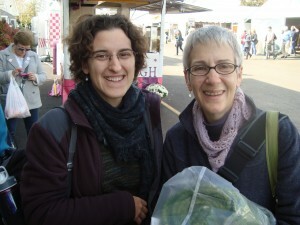 A few weeks ago, I was talking to Ellen about meeting up at Rhinebeck. It occurred to me that Anne would also be there. The color popped back into my head, and refused to leave. Something said that it was time. 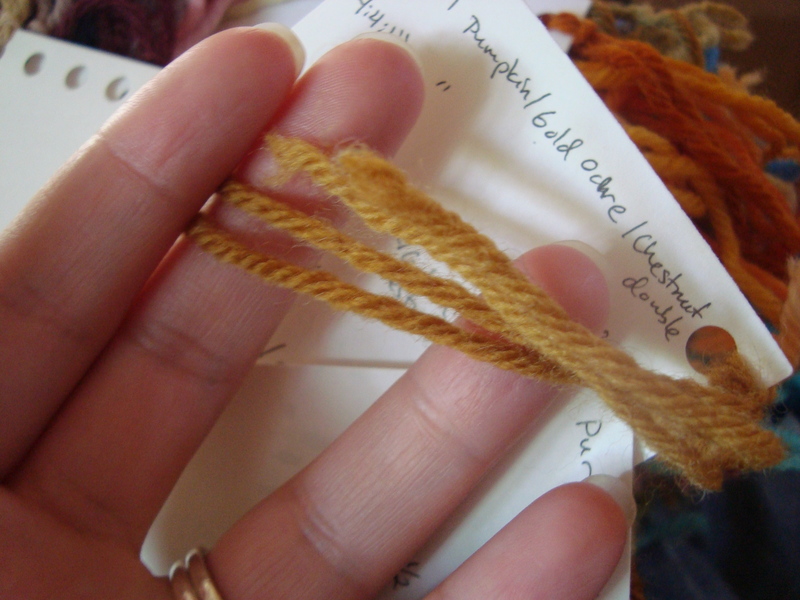 There is nothing I love more than cooking up a surprise gift, so I set off in search of the perfect fiber. I just love the way the gray and olive green bring out the richness in the gold. 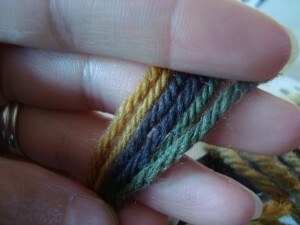 This was my colorway. On Sunday, I was wandering around the market when I saw a familiar face. Kim was standing in front of one of the show barns, and Anne was with her. Kim took the obligatory fan girl picture, and I tried not to gush too much. Fiber changed hands, and I think she liked it. I love when things come full circle like this. Anne inspired me to knit, taught me a lot about writing and design, and introduced me to Jocelyn, who introduced me to Ellen, who brought me to Rhinebeck, where I met Anne. Little ripples going out, and coming back again. I hope she enjoys her fiber. Time to spill the beans! YAY! I’m so glad you found her! She looks thrilled~~~ what a great story coming full circle…! Stay well. May all good things be coming your way! I hope she enjoys it too! Those do seem to be the colors she favors. I’m fortunate to know Anne, as we live in the same town and the lace class I took was with her. She’s really nice, and I have a definite weakness for her patterns. (That sweater I keep mentioning that I want to get back to? One of hers.) I’m glad you had a good time (well, it looks like you did!) and got to meet Anne. What a fabulous post!! I love that yarn, and knowing Anne I’m betting she adores it (not to mention getting a perfect gift from someone she hadn’t met yet). I hadn’t realized that you two had never met! (Actually, I forget sometimes that we haven’t “met”.) That is a great full circle indeed. I was so happy to see that picture of you with Anne! DesigKnit is powered by	WordPress 4.8.9 . Page generated in 0.392 seconds using 40 queries.